Some years ago we had some major renovation work done which included replacing all of the old windows and the old vinyl cladding on the exterior. We chose a light colour – ‘Evening Haze’, I think, for the Colorbond cladding and a dark charcoal grey for the window frames. 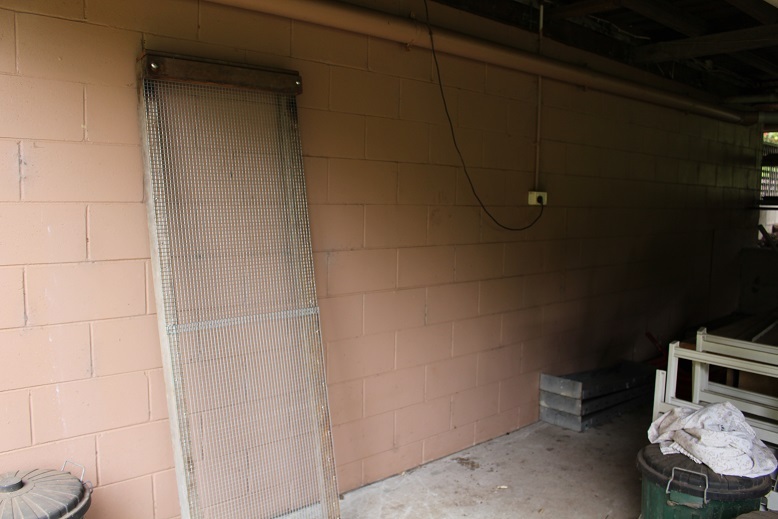 While it was not a high priority at the time, we knew that one day we would repaint the besser block garage and workshop from the current salmon colour to something that would tone in with the windows and cladding. We subsequently decided on a fairly dark grey which we have already used for the fence posts for the vegetable garden and new front fencing. These are both close to the house and we did not want to introduce yet another variation to the colour scheme. 2 weeks ago we painted the first coat on the wall at the back of the workshop. Here is the before shot. We did not finish the exposed pipe because we ran out of time before we had to go out but GMan was back at it yesterday. 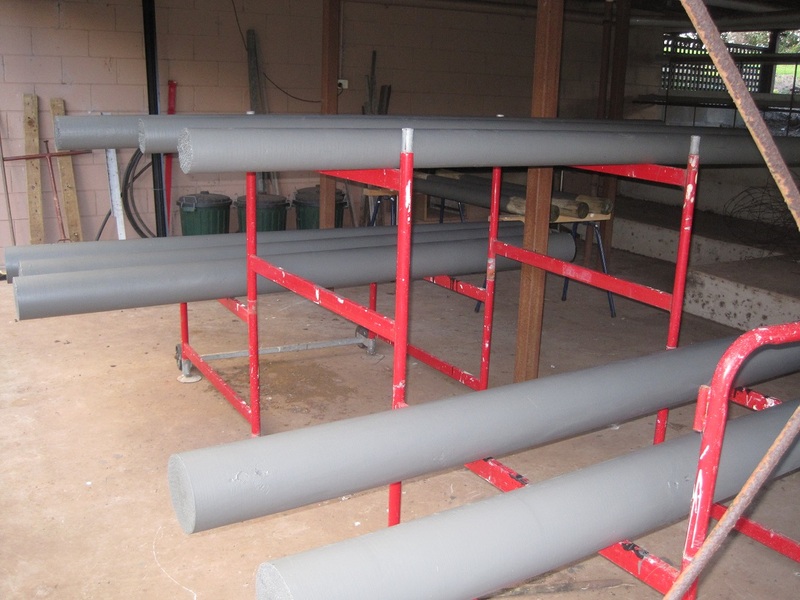 He finished painting the pipe and did the second coat as well. This had to be done now as we are getting a battery system for our solar panels sometime in the next month or so and the battery bank will be placed against this wall. Over time we will get all of the exterior walls downstairs painted and finally eliminate the salmon paintwork forever. 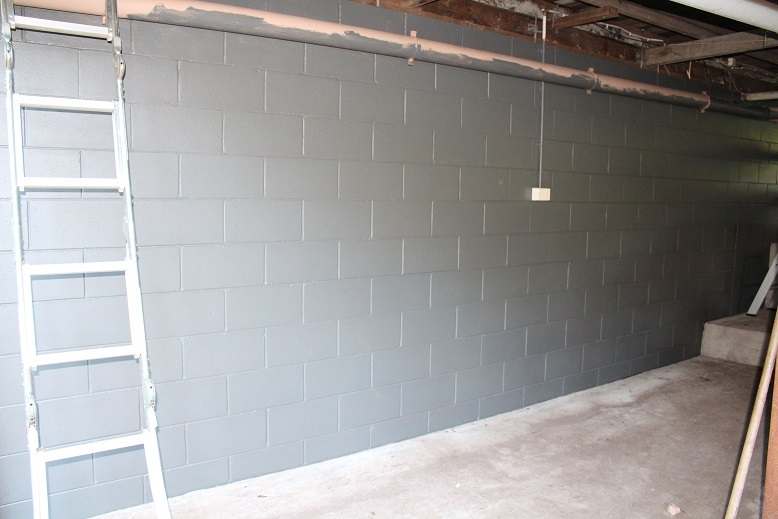 The same weekend as we started the exterior painting GMan re-painted the feature wall in the lounge room. We originally had the television mounted on the wall and when that arrangement changed a few years ago we plastered and re-painted the wall but did not have enough to re-do the whole wall. Even though it was the same tin of paint as was used originally Gman was not happy with the result and we bought a new tin to re-do the whole wall. That had not happened but when we had to move the furniture to position the restored cabinet he decided that the time was right to do the painting so that is another job ticked off the list. 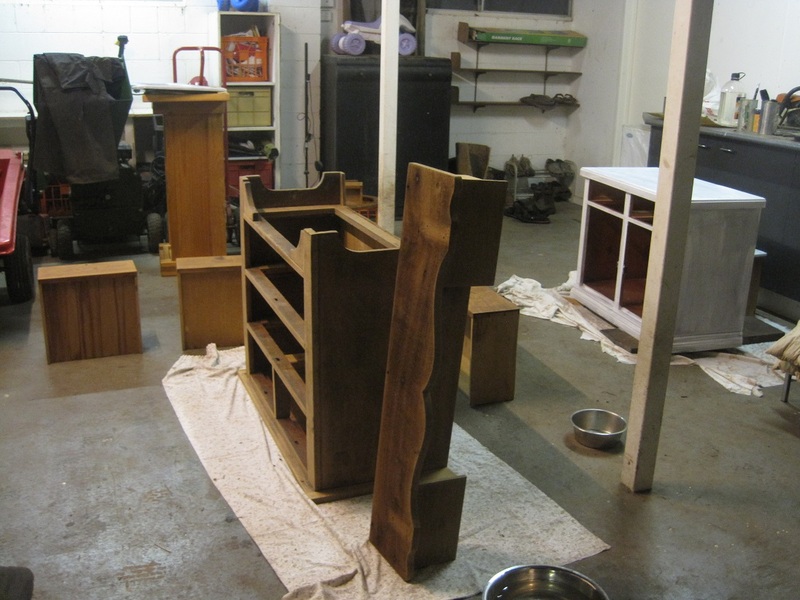 I do not have photos of each piece but The Duke and I have been busy today, working on 3 different pieces of furniture. The main piece is a silky oak chest of drawers/dressing table which we finally got around to beginning to stain. We bought it unrestored a couple of years ago and the Duke worked hard to strip all of the paint and sand the individual pieces. The oval mirror which attaches to the top has been dismantled and that was what was holding us back. We needed to have it resilvered and there always seemed to be something more pressing to do. The Duke searched on the internet and found that a large glass and mirror business in the city no longer do resilvering as it is cheaper, easier and more accurate to cut a new one, no matter what the shape or if there are bevelled edges. We will have the frame stained and take it with the old mirror next week to get a new mirror cut and fitted into the frame. Once it is finished it will replace the current pine chest of drawers that I am using. 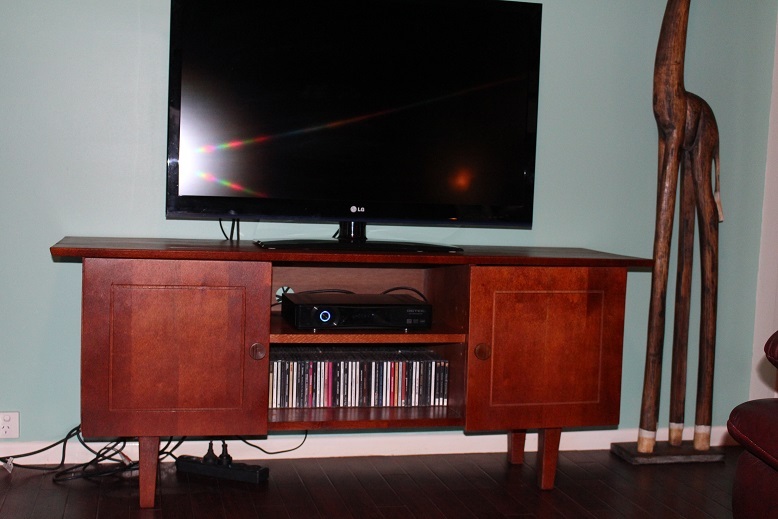 On the left-hand side of the photo is what was originally our TV cabinet which was used by our daughter for a few years and then found its way back home. Today we have sanded and undercoated it and the finish will be gloss white enamel and it will go in the guest (Air BnB) bedroom instead of the small decoupage desk which is there at the moment. Finally, there is a pine blanket box standing on its end in the background. We plan to use this as a storage box on the verandah. It will hold BBQ supplies and tools and will be painted ‘Woodland Grey’ which is the colour that we will be using for a lot of the exterior trim as well as all of the fenceposts. We have had this box for over 30 years but it has been superseded in our bedroom by an antique cedar chest. It had heavy rope handles which we removed and are replacing with metal handles. We bought them some time ago from Paddington Hardware along with all the new handles for the chest of drawers. The holes where the rope was attached needed to be filled so I sanded a piece of an old broomstick and cut it into pices to plug the holes. We overfilled them with Plastibond and tomorrow will sand the box including the Plastibond. It may take us a couple of weekends to finish them all but I am looking forward to taking photos of the finished articles to show you. 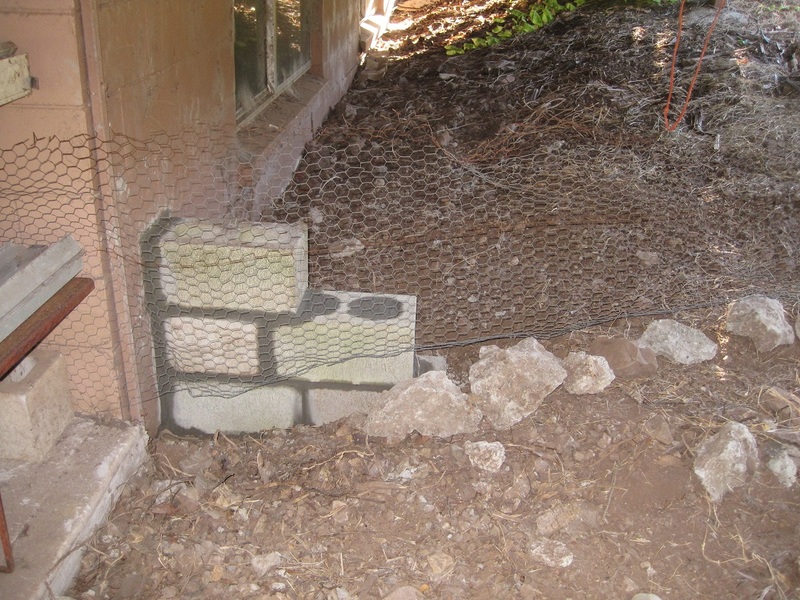 Almost 3 months ago one of my posts included a piece about building a small concrete block wall. Here is the beginning that I posted way back then. Like many of our projects, it has been rather a long-winded process as we try to fit things into the limited time on the weekends. The weather is another factor which curtails outdoor activity. 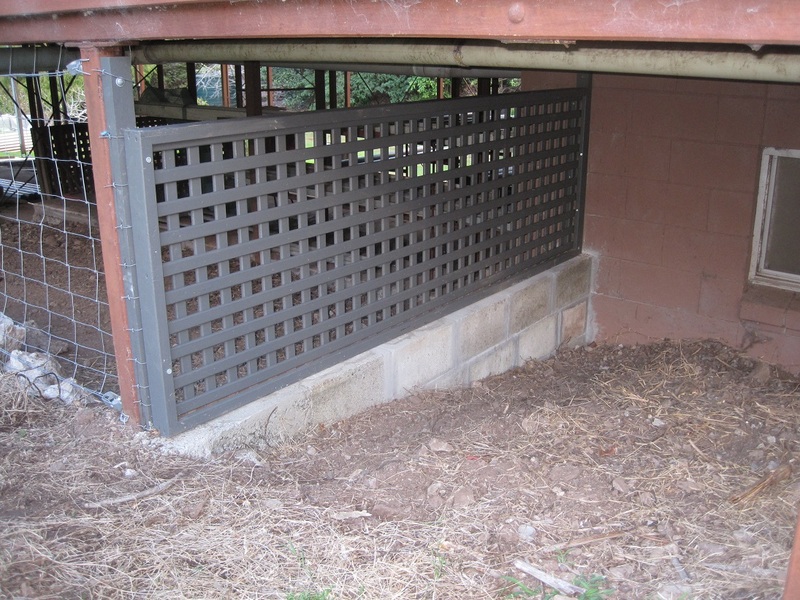 Today, it was finally time to put the timber lattice screen into position and secure it. We have also been working on painting the posts which will be used for the new chicken run. Most of them are finished but a few still need a second coat of paint. 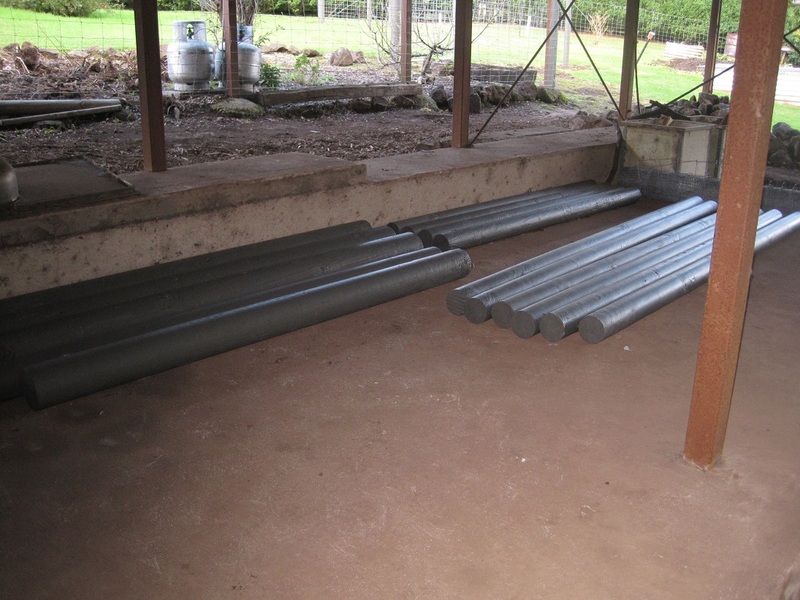 Here are the remainder on the scaffolding which we use to support them while we are painting. If the weather is kind we may get started on putting the first of the posts in the ground next weekend. Today we have spent the day at home catching up on several jobs. The Duke painted the ceiling of the bathroom and I did the edges of the cornices and also the new architraves on the window and doors. The ceiling is finished but the architraves need another coat. We have had the dehumidifier running in the bathroom for most of the day to get the paint thoroughly dry. Here is a photo which shows the new lights and also the painted ceiling and window frame. I also sorted out various things in the workshop and space under the stairs. Then it was time to list some things on Freecycle. Sometimes I do not have much success and other days everything is wanted. Today was a good day as I have found new homes for 3 small tins of paint, 2 spraycans of paint, a bathroom stool, the old showerscreen, some excess tiles from the laundry, tiling materials (adhesive, grout etc) and some timber slats. It is great that other people will be able to use them and we have freed up a bit of space. We moved the cupboard that had previously been at the foot of the stairs and it is now ensconced in the workshop. All of the paint and painting equipment is now sorted and stored in the cupboard. As is often the case, the re-arranging is a work in progress so is actually looking worse than when we started but that will soon change. 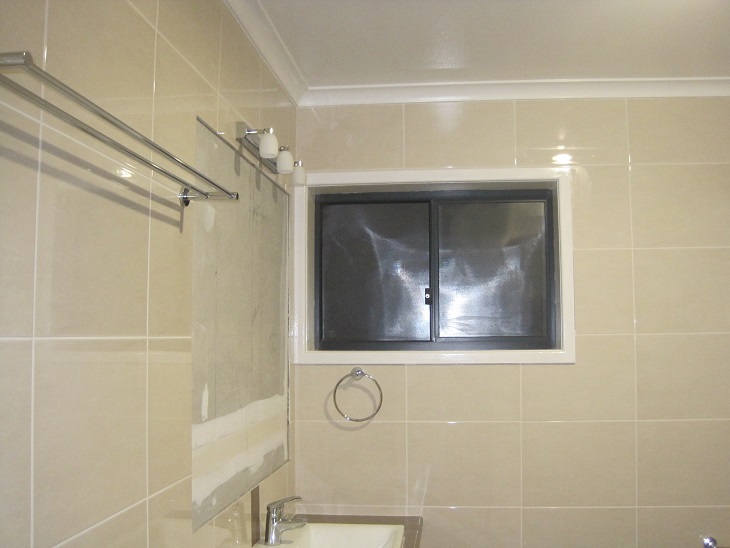 The showerscreen and mirror should be installed tomorrow so I am looking forward to that. It will mean that I can then replace all of my china and ornaments back on the sideboard. These were removed before the bathroom renovation so they would not be damaged when equipment was being brought in and out of the house. Things will soon be back to normal.